With two kids in school full-time, I make a lot of peanut butter & jelly sandwiches. After all, it’s a quick, easy lunch solution that the kids really love. However, I love getting creative in the kitchen and I decided to put my own spin on the classic PB&J sandwich. 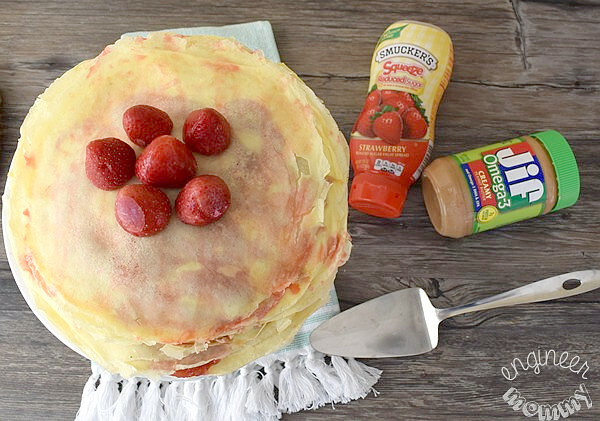 Today’s recipe is for a multi-layered Peanut Butter & Jelly Crepe Cake, featuring Smucker’s® Squeeze™ Reduced Sugar Strawberry Fruit Spread and Jif® Creamy Peanut Butter with Omega-3 DHA & EPA. As a kid, peanut butter and jelly sandwiches were my favorite lunchbox meal for so many years. Let’s face it… the pairing of savory peanut butter with sweet fruit-flavored jelly is a perfect match. My mom told me I was a pretty picky eater as a kid, but PB&J sandwiches were always a hit with me. Now my daughters are both following in my footsteps. While I wouldn’t necessarily say they’re picky eaters, I can say with certainty that they both absolutely adore peanut butter and jelly sandwiches. I guess the apple doesn’t fall far from the tree! Last week, instead of making another sandwich as usual, I decided to whip up something creative. This crepe cake consists of over a dozen individual crepes, which are stacked high and layered with peanut butter & jelly. This treat is quick and easy to prepare but totally looks festive & fancy. My kind of recipe! 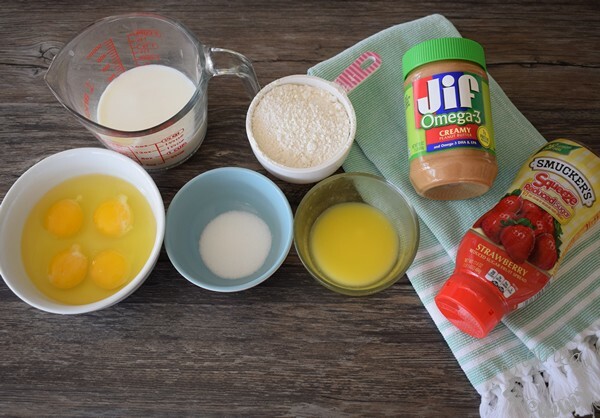 Gather the ingredients for this recipe: eggs, flour, milk, Smucker’s® Squeeze™ Reduced Sugar Strawberry Fruit Spread and Jif® Creamy Peanut Butter with Omega-3 DHA & EPA. I love that this peanut butter is enhanced with Omega-3 DHA & EPA – these fatty acids are so beneficial for overall wellness. Plus, this fruit spread contains reduced levels of sugar, which is something I appreciate. Scroll all the way down for the detailed recipe directions. Combine all the ingredients in a high-powered blender or food processor. 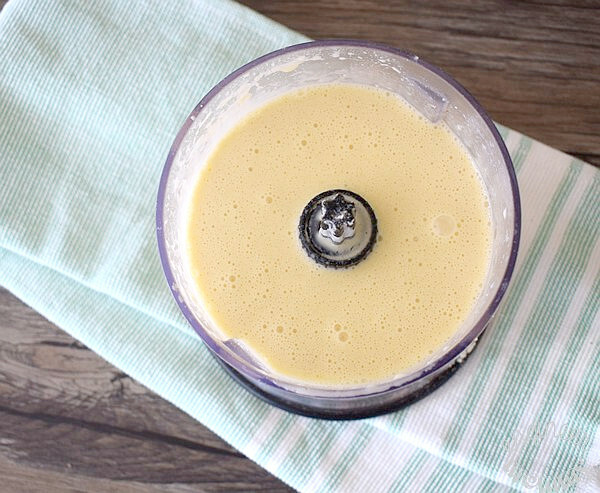 Blend ingredients together until the mixture is smooth and free of lumps. *Note: You can choose to manually whisk the ingredients together, but using the food processor results in a smoother batter. With a food processor, the resulting crepes will have a better texture. Notice the little bubbles on the surface of the blended batter- that’s what you want to see! Spray a frying pan with nonstick spray (alternatively, you can brush on a thin layer of butter) and place over medium heat. Pour about 1/3 cup of the batter into the pan and quickly swirl the batter all around the pan to cover the entire surface area. Cook for about 3-5 minutes. 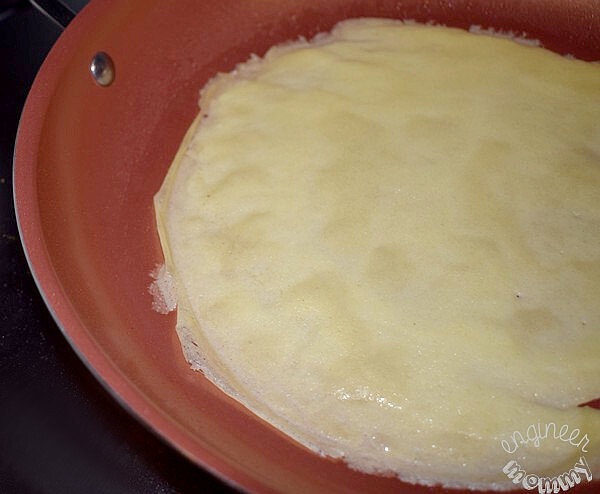 *Tip: When you see bubbles starting to form on the top of the crepe, it’s ready to flip. Flip the crepe using a flat spatula. Cook on the other side for just another minute or two. 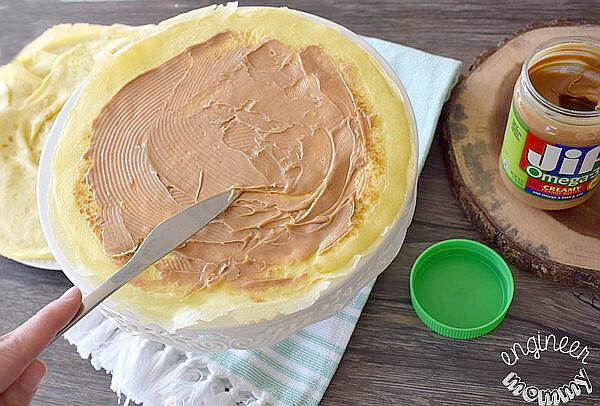 If you use 12″ pan, this recipe will yield about 15-18 crepes. If you use a smaller 9″ pan, you will have more crepes. 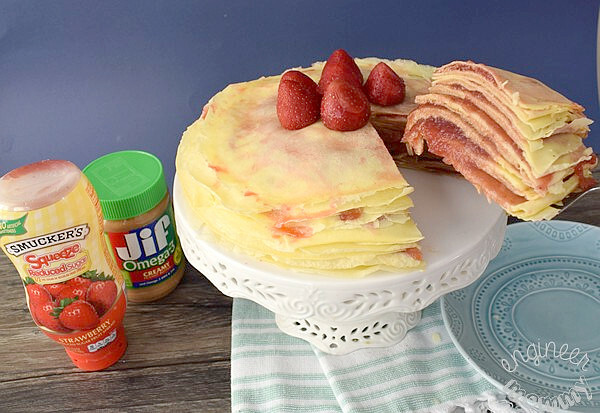 Create a nice stack of your crepes. 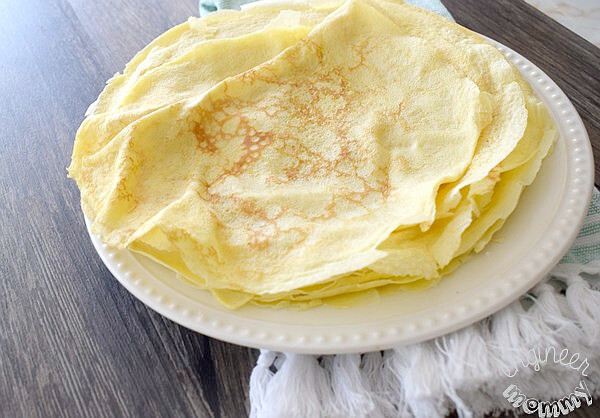 Notice the golden brown color and delicate texture of the crepes. 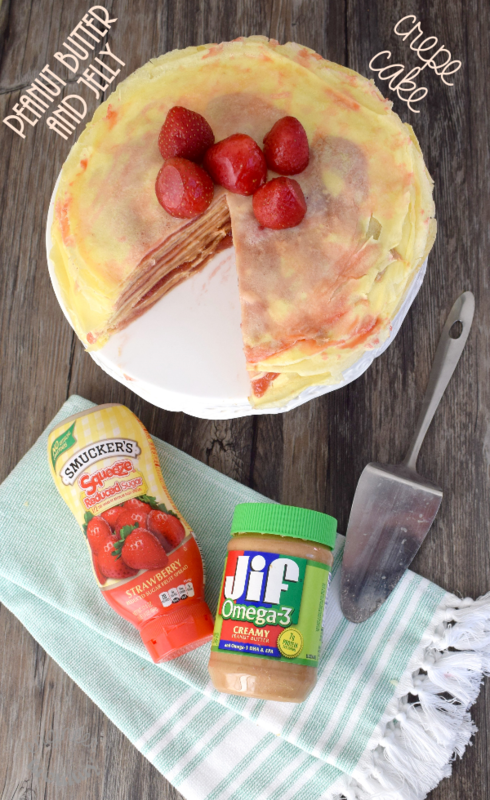 Now, it’s time to gather Smucker’s® Squeeze™ Reduced Sugar Strawberry Fruit Spread and Jif® Creamy Peanut Butter with Omega-3 DHA & EPA. We will be spreading peanut butter onto one crepe and fruit spread onto the next crepe, alternating all the way up the stack. This Jif® peanut butter is my family’s favorite. The smooth, creamy texture makes it a breeze to spread onto sandwiches, crepes, waffles, and more. It didn’t even rip these delicate crepes. Plus, this peanut butter has a fresh roasted peanut taste that is irresistible. 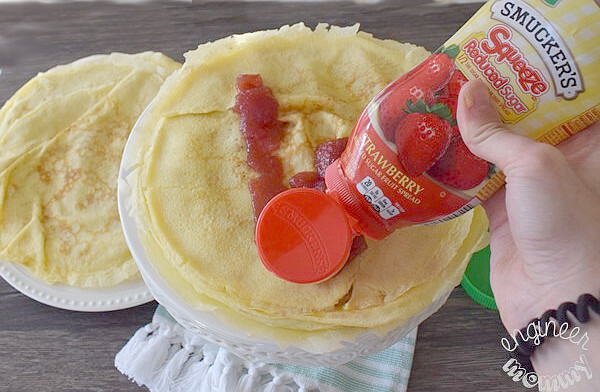 For the fruit spread layers, this Smucker’s® squeeze-able bottle made it so easy to apply to the crepes. It adds the ideal bit of sweetness. I love that it’s made with real fruit. 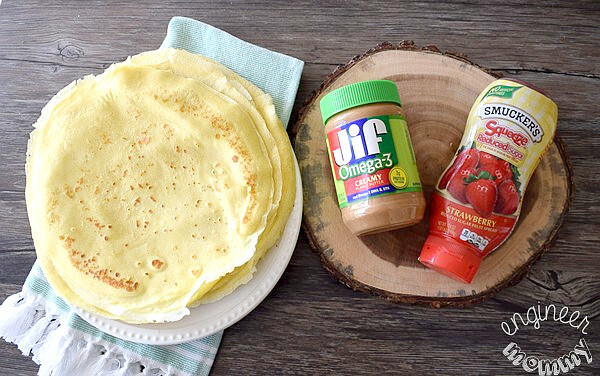 Continue spreading the peanut butter & jelly onto the crepes and stacking them high. Here is the finished product. Doesn’t it look so fun and festive? I have made plenty of desserts over the years, but this one was so easy to make and looks so amazingly fancy! With Smucker’s® Squeeze™ Reduced Sugar Strawberry Fruit Spread and Jif® Creamy Peanut Butter with Omega-3 DHA & EPA, getting back to the everyday routine after holiday break has been easy. This is a fun recipe that I feel good about serving to my family. To serve it, I simply cut a slice. I love seeing all the different layers filled with delicious peanut butter & jelly! Each slice is perfect as an after-school snack or even placed in a lunchbox for a fun, unique meal. 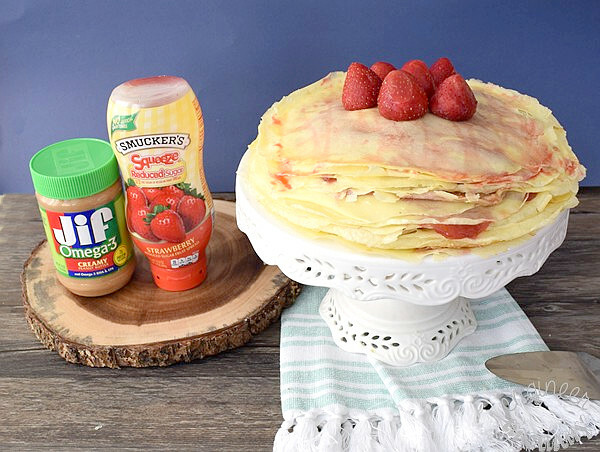 This crepe cake has been pretty popular around our household recently and for good reason- the delicate crepes pair so well with the savory peanut butter & sweet fruit spread. If you’re looking to put a fun spin on peanut butter & jelly sandwiches in your household, be sure to try this recipe. 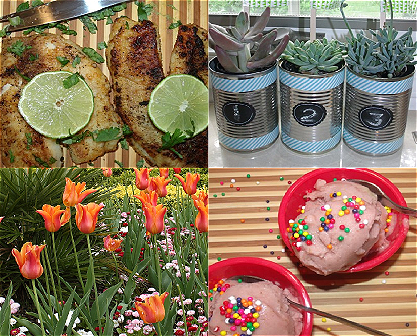 The great taste is sure to be a winner with your kids, too! 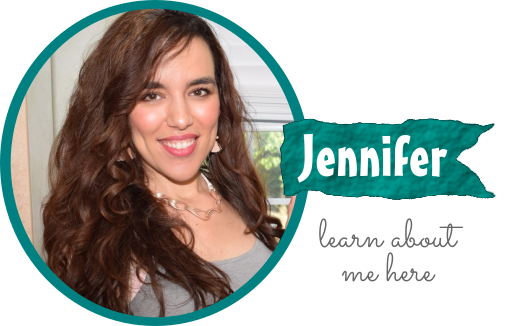 Don’t forget to take advantage of this coupon offer here, where you can save $.50 off each individual product (there’s a bonus $1 if you buy both). This offer begins on 12/31 and ends on 2/3. 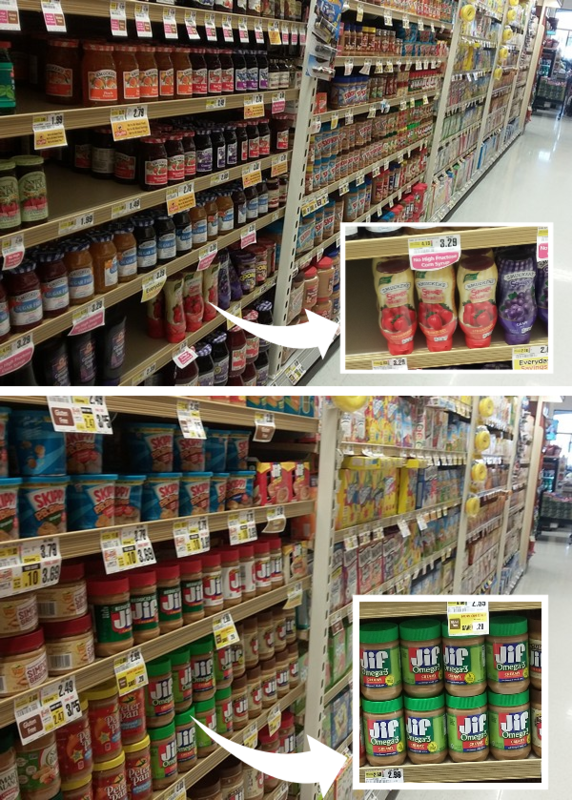 Look for Jif® peanut butter and Smucker’s® fruit spread at your local ShopRite store. I visit the store at least once a week and I love the great everyday value on my family’s grocery essentials there. 1. 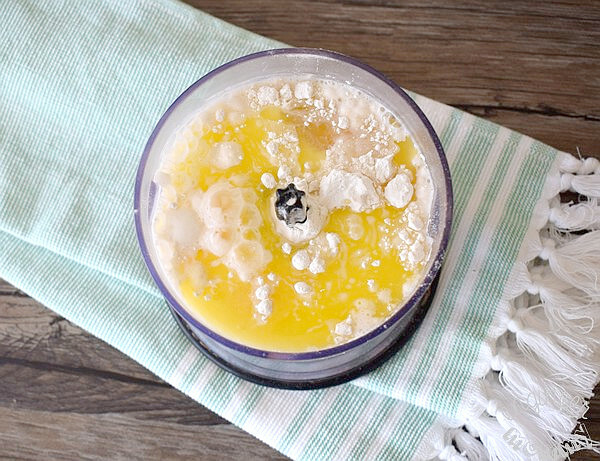 Place the flour, sugar, milk, butter and eggs in a food processor. Blend until smooth. 2. Pour 1/3 cup of batter into a greased frying pan. Cook for 3-5 minutes. 3. Flip the crepe. Cook for another 1-2 minutes. 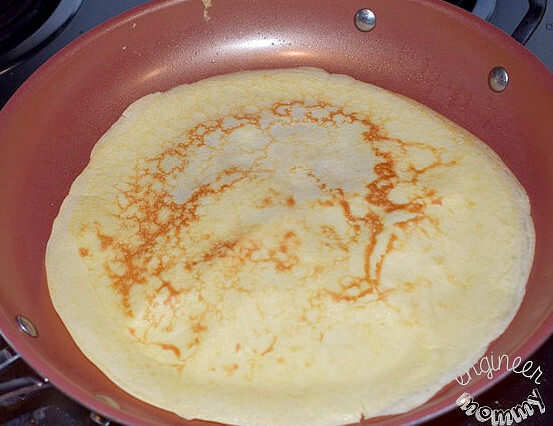 Continue creating crepes using all the prepared batter. 4. Spread the peanut butter & jelly between the various crepe layers, alternating between each one. 5. Slice the crepe cake to serve. Optional: Top with fresh strawberries. Pick up Smucker’s® Squeeze™ Reduced Sugar Strawberry Fruit Spread & Jif® Creamy Peanut Butter with Omega-3 DHA & EPA and put your own spin on the classic PB&J sandwich. Do you like crepes? 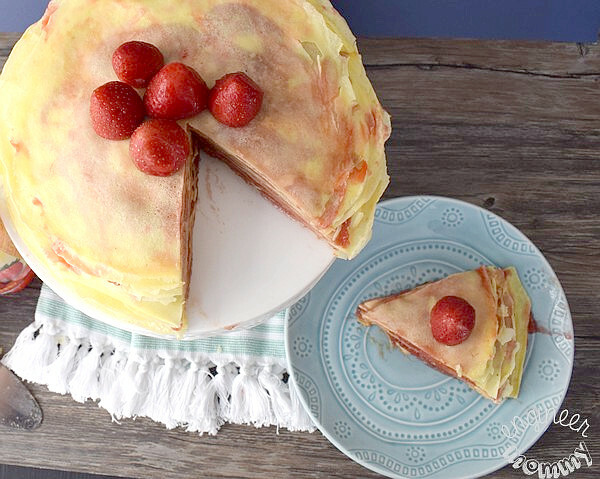 Have you ever made a crepe cake? I love this idea. I know this would be a HUGE hit in my house. I HAVE to make one of these for my family! Hope you try this! If you do, let me know what you think! 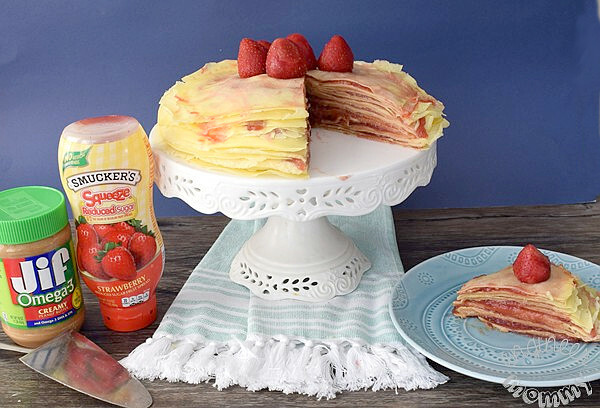 Never thought about stacking the crepes and making it into like a cake. How do you keep the stack warm enough to eat? We do a bunch of peanut butter and jelly as well. 2 of my favorite things, crepes and peanut butter and jelly sandwiches. I’ll have to give this a try! Yes, it’s amazing! And it looks so festive too! Yum, I don’t think I’ve ever had a crepe cake before. I must try this soon! I love regular crepes so I’m pretty sure I’d love them in cake form. 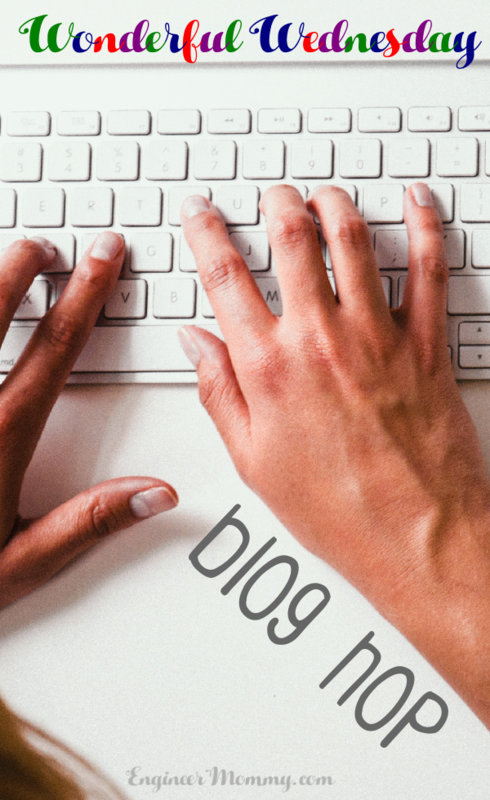 All that I can say is WOW…love this idea! Wouldn’t it look great for Valentines Day? I love that this “cake” could be made healthy for the kids and they would think they are getting a snack. This sounds tasty! Oh yum!! Peanut butter and jelly sandwiches are still my favorite, so I totally would love this!! It looks so delicious and fun! Now I want to make it for my teenage boys who looove crepes. this is a really great recipe idea! I would love to try this one some time. I have never had a crepe cake before but it certainly looks tasty. I have always liked crepes! Me too, but I only have one kid in school. This is a great twist on an old classic. I think my girl would go for this. I do enjoy crepes but don’t have them very often. I had an idea very similar to this but didn’t make it. I’m glad to know it would have worked! This is awesome. I have never imagined making a crepe cake but this sure looks fantastic. I mean we can tweak it and use a different filling of choice. I am thinking of cream cheese and blueberry jam. Yum. The crepes look so soft and thin.Together with the jelly and the peanut butter it makes for a yummy cake. Looks irresistible. Wow! This is not only beautiful to look at but it looks beautiful to taste. Finally a cake for breakfast! I am keeping this recipe for later use when I am brave enough to attempt it. Wow, this is a layer after another layer of yumminess. My daughter is really good in making crepes, however we can’t have peanut butter as my son is allergic. This recipe looks delicious! I would leave out the jelly in some areas for myself. Seeing the pictures makes me drool and want to have a taste of this. I am saving the recipe so I can try it on my own. Thanks for a very detailed post! Excited to try it! I used to go to this crepe restaurant in Emeryville, CA for lunch all the time. They had nothing but crepes on the menu and crepe cakes were always a huge seller. I’ve never made one but now that I have this recipe I just may have to try it out.